What is a Little Black Ant? One of the most common ants in homes, the Little Black Ant is active day and night and is often seen carrying particles of food many feet back to its nest. Their colonies are large – with thousands of workers and several queens. Little Black Ants eat a wide variety of foods including sweets, meats and other insects – living or dead. Their preferred food is honeydew – the sweet secretion of plants. In the house they tend toward sweets, meats, bread, grease, oils and fruit. When they find a food source, they release a pheromone that calls worker ants to help cut up and cart the food particles back to the nest. The workers are known raise their abdomens and spray venom when threatened or alarmed. Outdoors, Little Black Ants nest in open areas of soil in lawns creating very small craters of very fine soil. They also nest under dead and decaying wood – logs, tree stumps, dead tree limbs, tree bark, firewood and hollow tree cavities; beneath leaf litter, rocks, and bricks; and in old termite galleries. Indoors they nest in wall voids, woodwork, masonry, and under carpeting. Painful bites can cause swelling and inflammation. When disturbed they raise their abdomens and spray venom at any rival ants. For such a small creature they can even invade fire ant colonies and take over. They have also been known to damage electric cables, clothes and fabrics. 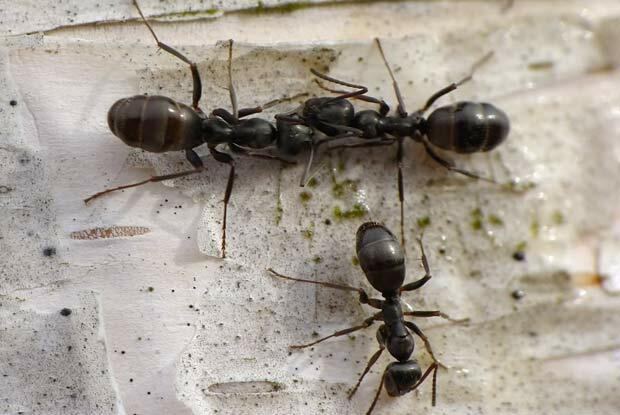 Our pest control experts at Portland Pest Guard are like super sleuths who can find how the ants are entering your home, uncover some of their unusual nesting sites and create barriers. We have access to special ant control baits and repellants that help provide a long-term solution to stop current and prevent future infestations. Plus, our control methods are safe for your family members and pets. Give us a call today at 503.720.8559 to learn more about Little Black Ants or to schedule an inspection! *Portland Pest Guard provides pest control service to most cities in Western Oregon and Southern Washington. Including: Beaverton, Cedar Mill, Gresham, Lake Oswego, McMinnville, Portland, Tigard, Vancouver and surrounding areas.